3 bedrooms and 1 bathroom. Sleeps six people. 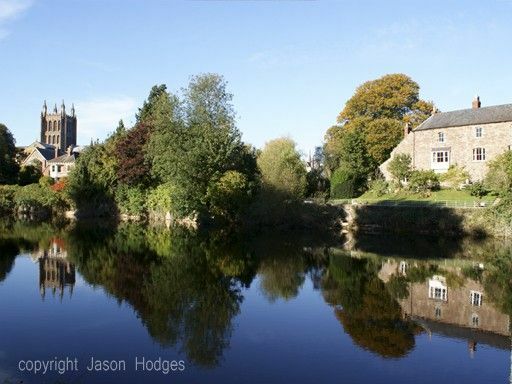 Located on the banks of the River Wye, in the historic Cathedral city of Hereford, Castle Cliffe has been restored to provide luxury self-catering holiday accommodation for six people. Though medieval in origin, the house now boasts night storage central heating and open fires in all rooms, period furniture throughout and a four-poster bed. Spread over 2 floors, the accommodation includes a fully fitted kitchen, sitting room, bathroom and separate WC on the ground floor, with three double bedrooms and another WC on the first floor. Bedroom 1 has a king-size four-poster bed, bedroom 2 has a double bed and bedroom 3 has two single beds. The house is within walking distance of pubs, restaurants, shops, cinema and the theatre. The house also has south-facing riverside gardens and is surrounded by parkland. Castle Cliffe is a great place to relax with friends and family and to use as a base for exploring the beautiful countryside, mountains, castles and abbeys of this Welsh Border Region. Hereford City Centre: History is almost tangible in the centre of Hereford, and nowhere more so than in the area surrounding Castle Cliffe. Having been occupied for over 700 years, the old watergate of Hereford Castle has not only seen its own use changed. Castle Green, once the site of battles, is now a city park on the banks of the River Wye. Surrounded by Hereford Cathedral, the old castle moat and Bishop's Meadow, you would not believe you were only three minutes walk from High Town and its busy shopping streets. An Historic House: Castle Cliffe is the last remaining part of the Hereford Castle complex. Built during 13th century, it was originally the watergate for the main castle - a very grand entrance to an important castle, the original arch can be seen in the front garden. It has had a colourful history since those days, having been used as a Bridewell (local prison), the Govenor's Lodge and becoming a private residence sometime during the 18th century. A Modern Holiday: The East House of Castle Cliffe has been lovingly restored by the present owners to provide luxury self catering holiday accommodation for parties of up to six people. With its own private south facing garden on the River Wye and its accessibility to the Brecon Beacons, Black Mountains, Hay-on Wye, Tintern Abbey to name but a few, Castle Cliffe is an ideal holiday home. Please note, the owners live in the West House, but assure you of your privacy. The bathroom at Castle Cliffe has medieval walls dating back to when the house was built in the thirteenth century. It has an arched window with shutters, a large Victorian roll-top bath, candles, a separate electric shower and a wash basin with shaver point. The house also has 2 separate toilets, one on the ground floor with wash basin and shaver point, and one on the first floor. Castle Cliffe provides luxurious self-catering holiday accommodation in a historic building on the banks of the River Wye. A lot of attention has been given to comfort and authenticity, and the house is furnished with period furniture throughout. There is a large, light and well-equipped kitchen with a Belfast Sink and open fire. The sitting room has comfortable armchairs, a chaise lounge, Freeview digital television, DVD player, views of the garden and river, and an open fire. Perfect for relaxing with family and friends. Castle Cliffe has been awarded a Four Star rating by the English Tourist Council (ETC) Quality Assurance Scheme. Excellent break in an excellent property. Lovely property, everything you could wish for with added history! Great location, rooms large and comfortable with a very homely atmosphere. Lovely house. Great location. Will definitely be staying there again. This property is in a great location. It has all the warmth of a modern property whilst maintaining it’s history. The whole family enjoyed our stay in Hereford and this building. Excellent house in perfect position. Phil, our host let us in very late and nothing was too much trouble. Thank you! Lovely central place to stay. Clean comfy very well equipped and convenient . We had a great long weekend here. Convenient for all of Hereford's sights. Only a short walk to centre of town but felt like you were in the countryside with the river just in the garden. Thanks for the lovely review. We're glad you enjoyed your stay at the house. Thank you Gillian. We're so glad you enjoyed your stay at Castle Cliffe East. Hereford is situated in the Welsh Marches on the banks of the River Wye. Surrounded by tranquil parkland, it has riverside gardens and is within walking distance of shops, restaurants, theatre, cinema, Hereford Cathedral and the world famous Mappa Mundi Exhibition. The house also also provides easy access to beautiful countryside, Welsh castles, Cardiff, Bath and Hay-on-Wye. Visit the Black Mountains and Brecon Beacons national Parks, tour black and white villages for antiques and tea and cake, or drive along the beautiful Wye Valley to Tintern Abbey and the Devil's Pulpit. PRICES - our prices for weekend breaks (Friday to Monday - 3 nights) and midweek breaks (Monday to Friday - 4 nights) are half the weekly rate. For 5 or 6 night stays our price is based on a nightly rate. When you submit your enquiry the HomeAway website always generates a quote based on a nightly rate. As a result, the quote you get from HomeAway may not be exactly the same as our quote.